Two mornings ago, I was walking the velvety-eared Delilah when we were stopped short in our tracks by a fawn crossing the road. There it was, between the sunbeams--so peaceful and pure. It took a bit of quick maneuvering (fishing the phone out of my coat pocket; stepping on the dog's leash to hold her in place) but I managed to capture a few shots as the fawn passed us by. When I got back home, I reviewed the shots and started the usual process of trying out edits. Should I change the color? Alter the light? Add a texture? But the truth was this: The fawn in the morning light didn't need my help at all. It was perfectly beautiful just as it was. It got me to review more of my shots. What else was fine exactly as it was? Mother Nature really is the best artist, don't you think? My Week in 5 Photos: A Deer Appears! One of my favorite things to do in the morning is curl up in a comfy chair with a view of the woods, blank notebook in hand, hot tea at the ready. If I'm just gazing outdoors to a peaceful view, my thoughts can naturally wander and I can (usually) come up with a new idea or two. But sometimes, as I'm looking out at the woods, I suddenly realize that somebody is looking back at me--a deer, or two, or three! They blend in remarkably well. Even Delilah can sleep through some of their secretive visits! I'm half-Swedish but I know far too little about my Swedish roots, so I've been studying all kinds of Swedish things lately. I love the simplicity of Swedish design. The following shots of leaves remind me of the Swedish aesthetic: crisp and pure and uncluttered. The golden leaf below reminded me of a potato chip...maybe I was just hungry for lunch? The shot below was my favorite picture of the week. I think it's very "Swedish country-style" with its clean, red color against a neutral backdrop. I hope your weekend is a crisp and lovely one! Registration is now OPEN for my online photography course running in November: "The Art of Photography: How to Take Your Pictures to the Next Level." Join me! The Splendiferious Ninth Anniversary Panjandrum! How to Enjoy the Great Outdoors...Without Leaving the House! Today's guilty confession from this nature-loving blog girl: I haven't really been outside for a week. There, I've said it. In my defense, the temperature in the mornings has been hovering between 4 and 8 degrees--Fahrenheit, not Celsius--with a bitter, bone-chilling, unrelenting wind. What I've learned from this run of really, really cold weather is that I'd make a terrible Canadian. Or Chicagoan, for that matter. I'm half-Swedish, so you'd think I could handle the cold by genetics alone, but my other half is Italian, so it all evens out. Most of the snow has been covered with a thick sheet of ice, so simply walking around outside has become an extreme sport. When I took our books back to the library yesterday, I promptly fell flat on my back, feet whipped out from under me, on a sheet of black ice. I was somehow heart-warmed to hear a total stranger blurt out a blue streak of obscenities in raw, unadulterated concern for me as he rushed over, lickety-split, to help me up. "You're lucky that you're not an old lady--you would have been TOAST!" he gasped in relief after I assured him that I was fine. Other than still walking the dog four times a day (not as far as usual), I just haven't had the same get-up-and-go to get out there. My blogger friend Debi at Go Explore Nature (whom I told you about in 10 Green "Gifts" That Won't Cost You a Dime) has been on a mission this month to post a suggestion every single day for getting outdoors with the kids. (Debi lives in L.A., mind you.) She has some very clever and creative suggestions, even for cold weather, and I plan on following many of them...as soon as the temperature inches up into the double digits again. As soon as I open the blinds, I watch the sun rising. It rises a little after 7 a.m. now---not such an ungodly hour. When I wake up the kids, they watch the sun rise with me. Peaceful. Another doe, pictured below, seems to have bitten into something that bit her back--a thorny bush, perhaps. See her tongue split in half and hanging out? Her tongue stayed out, flapping limply in the wind. Poor thing! I am a firm believer in "a room with a view", so the desk in my office faces a window where I can watch the day unfolding outside. If I stared at a computer screen all day without these visual breaks of nature, I would not be a happy camper and I'm sure I'd need eyeglasses much thicker than the ones I own now. It's helped us enormously that we bought an easy-to-use field guide for birds of New Jersey a few years back. Sure, we already knew the Blue Jays, Cardinals, and Chickadees, but now we also know what a Dark-eyed Junco is--turns out we have LOTS of those little cuties! So, yes--we are indoors for now, but we are still finding our own ways to appreciate the Great Outdoors. Your turn: How do you appreciate nature from indoors? Please share in the comments section below. Don't get left out in the cold! 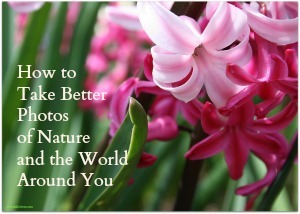 Register now for my March photography e-course, "How to Take Better Photos of Nature and the World Around You." Learn more and register here. Frozen Dogwalkers of the World, Unite! This week, notice there is softness in winter, too. ...and pretty soon, I'm learning that turkey vultures (so that's what they are!) eat almost exclusively carrion (elegant word for "roadkill"), and glide through the air on thermals (warm air drafts), sniffing out their next meal. These scavenger birds play an important role in the ecosystem, stemming the spread of disease--we've taken to calling them "Nature's Clean-up Crew." Some cultures believe they are sacred animals that release the soul from the body of the deceased animal, which is a rather poetic way to look at it, don't you think? City-dwelling friends occasionally ask us if we're nervous about living in "black bear country", in a neighborhood where I fought off a coyote that wanted to eat my dog for breakfast. Yes, living in close proximity to wildlife has its (rare) heart-pounding moments, but mostly, it's immensely interesting and gratifying. And the heart of the matter is this: I'm much more nervous that my great-grandchildren won't know what it's like to live in such a place, with a large array of wild animals roaming freely through the back yard, making their way out of the wonder-filled woods. Did you enjoy this post? Please share it with a social media button below. The Birds of New Jersey Field Guide is an Amazon affiliate link. If you decide to purchase it, along with any other products on this site linked to Amazon.com, I hope you'll do so through the link; it puts a few pennies in my pocket and helps support this blog. I will never recommend any products that I don't personally use and enjoy. Nooky vs the Turkey Vultures - in his back yard! Yesterday, while I was reading Anna's blog post at Green-Talk about how she protects the vegetables in her garden from deer and other critters by covering them with old pantyhose (ingenious and comical at the same time), I got to thinking about our collective love/hate relationship with deer. The White-Tailed Deer in northern New Jersey are virtually everywhere--moseying through the rural sections as well as the suburbs, and too often, not making it across the busy highways. Anything we're growing that we want to eat, we keep on our deck or in our greenhouse because we've been burned one too many times by deer making a quick smorgasbord of our new plantings. Sometimes I resent the deer for their insatiable appetites (realizing, of course, that they're just trying to survive in a world where the borders between "us" and "them" are shrinking), but I have to admit, they are really beautiful animals. Funnily enough, they've always reminded me of ballet dancers with their elongated-but-muscular, delicate-but-capable bodies. And their ability to blend in with the forest is nothing short of amazing. Sometimes, we can be out on our deck, having a meal and looking out into the woods, thinking we're just seeing the trees, and then a deer rises to its feet--and then another--and then another--and we realize it wasn't just the trees after all. Just last week, my nine-year-old son walked to the edge of the woods in our backyard and came face-to-face with a deer about 10 feet away. He kept edging closer and closer, and finally stopped, standing there in a sort of wordless conversation with the animal. There was something magical about the two of them standing there in silence and stillness, regarding each other with curiosity. Both of them young and beautiful in their own way, but together, an exquisite pairing. I asked him later what he felt in that moment. "So peaceful," he replied. As a society, we've definitely got polarized feelings about deer. I know a few people who hate deer because of Lyme Disease, and I hail from East Lyme, Connecticut, the epicenter of the disease, so I'm no stranger to it (having gotten the tell-tale bull's-eye rash over three decades ago, before most people even knew what it was), but to me, it's just blaming the messenger: The ticks are the ones who have latched on for the ride. I know a lot of people who endorse "thinning the herd" through hunting, and others who still feel heavy guilt and sadness because their car hit a deer. I just saw an article yesterday about a family fighting to keep a pet deer they've raised since it was born. We often have various friends visiting from the city (New York) who can't believe their luck when a large herd of deer meanders across our yard. Our guests scramble for their camera-phones and start snapping away. But for us, it's just another day and another deer herd, making its way across our shared terrain. Now and then, we stop to take a picture of them, too. How do you feel about deer? Love 'em, hate 'em, or somewhere in between? Why? How do you keep them from eating your plants? Please share in the Comments section below (now powered by CommentLuv for ease of use). If you are reading this post via email subscription, click on the title or go to www.JoyfullyGreen.com and you can leave a comment at the original post. Most of the snow is gone now and has been replaced with sheets of ice; therefore, simply walking around outside has become a challenge. When I took our books back to the library yesterday, I promptly fell flat on my back, feet whipped out from under me, on a sheet of black ice. I was somehow heart-warmed to hear a total stranger blurt out a blue streak of obscenities in raw, unadulterated concern for me as he rushed over, lickety-split, to help me up. "You're lucky that you're not an old lady--you would have been TOAST!" he gasped in relief after I assured him that I was fine. Other than still walking the dog four times a day (probably setting all kinds of speed-walking records), I just haven't had the get-up-and-go to get out there. My blogger friend Debi at Go Explore Nature (whom I told you about in 10 Green "Gifts" That Won't Cost You a Dime) has been on a mission this month to post a suggestion every single day for getting outdoors with the kids. (Debi lives in L.A., mind you.) She has some very clever and creative suggestions, even for cold weather, and I plan on following many of them...as soon as the temperature inches up into the double digits again. Another doe, pictured below, seems to have bitten into something that bit her back--a thorny bush, perhaps. See her tongue split in half and hanging out? Her tongue stayed out, flapping limply in the wind. Poor thing. When I do get outside for the dog-walks, I often hear Canadian Geese overhead. I marvel at their V formations and the way the leader honks to the others to guide them along, and they honk right back in response. Nice teamwork, guys! It's helped us enormously that we bought an easy-to-use field guide for birds of New Jersey a few years back. Sure, we already knew the Blue Jays, Cardinals, and Chickadees, but now we also know what a Dark-eyed Junco is--turns out we have LOTS of those little cuties. Food for thought: How are you interacting with nature this winter? What animals have you seen out foraging? Did you enjoy this post? Get more like it by subscribing by email or RSS reader (righthand column). © 2013 by Joy Sussman/JoyfullyGreen.com. All rights reserved. Text and photographs digitally fingerprinted. Site licensed by Creative Commons. If you've had a relatively happy childhood, I think that in adulthood, you're always trying to recreate or recapture the happy moments, and revisit the special places of your youth--if you can. For my husband, who grew up sailing with his family just north of New York City, he's still at his happiest when he's out on the water, and if he can't be out on the water, he's reading sailing magazines to relax after a long day at work. My own childhood, although also happy, gave me a very different view of peacefulness and personal bliss. Instead of the water, it was the woods. I grew up in a small town in Connecticut, on a quiet cul-de-sac called Willow Lane--even though there wasn't a single willow tree in sight. Our neighborhood had no shortage of other trees, though, as all of the houses on the north side of the street had the woods to border their back yards, a sprawling range of trees that ran for miles and miles. My bedroom window faced the forest. Each night, before climbing into my canopy bed, I would stand on my ladybug stool and peer out into the woods. In summer, my nose pressed up against the screen, I could see the little flashes of fireflies, traveling in drunken, weaving patterns around and about the trees. I'd fall asleep to the sound of peepfrogs and wake up to the first bird songs of morning. About a hundred feet into the woods, just off the well-worn path, was a boulder the size of a Volkswagen Beetle, with the words MAGIC ROCK painted in white capital letters on its side. No one knew who had painted the words, but everyone knew the wishing procedure: Stand atop the boulder, slowly turn around three times, and make a wish--only one wish per forest visit, and no wishing on the way back out! My sister, eight years my senior, introduced me to the forest. Each December, she would drive me in a wheelbarrow deep into the snowy woods, where we would select the perfect miniature Christmas tree for her bedroom. Carefully, she would dig around its roots, and we would plop the whole package, soil and all, into the wheelbarrow. Later that night, the little tree would sit in a bucket on her desk, bedecked in our homemade garlands of popcorn and cranberries, with a simple strand of white lights. After the holidays, my sister would transplant the tree to our back yard, at the very border of the woods. By the time she went off to college, there were five fir trees on the border of our yard. In spring, when my sister returned from college, she took me into the forest again. The ground was soft underfoot, and the trees were in full bloom. Kneeling on the bank of a stream, we scooped out frog eggs, pasty-white jelly masses with black dots for centers. We carried them home in beach pails to study, and in a short time, the eggs separated and sprouted long, wiggly tails. Then it was back to the stream again, to send the tadpoles on their way. In my sister's absence, my father became my guide to the woods. Although he tended three gardens in our own yard (two for flowers, one for herbs), he took it upon himself to be a caretaker of the forest. I accompanied him on his missions: clearing piles of leaves from the dirt paths, weeding out fallen trees, and with our bare hands, scooping out cold mud and twigs from a blocked brook until the water ran freely again. On weekends, bright and early, my father and I would head out into the forest, followed at a great distance by our cat, Snoopy, whom I suppose was trying to maintain an air of feline independence. Snoopy never got within fifty feet of us, but then again, he never ventured off on his own path, either. We'd stop every now and then to make sure he was following, and he'd stop and pretend that he wasn't. On our journeys through the woods, my father would point out different plants and trees, insects and animals. Over the fallen tree--an impromptu bridge across the first pond on our journey--past birch ("white bark) and mountain laurel ("white blossoms"), we'd make our way past thickets and tangles. Skirting poison ivy ("leaves of three, let them be") and the hawthorn bush ("needles sharp enough for sewing"), we'd at last come to the meadow. Crouching amidst the tall grass and wildflowers ("Shh...not a sound"), we would almost always be witnesses to something extraordinary: a jackrabbit bounding about, as if on springs; a garter snake basking on a rock ("he won't hurt you"); a pheasant strutting cockily, looking for its lunch; a stately stag--despite its size, so shy and soft; a Native American arrowhead to take home in my pocket; the Big Old Oak, with its trunk so fat, it would take five children to encircle it with their arms. As I got older (about ten or so), I got bolder, braving the forest on my own. A latchkey kid, I'd make secret trips into the woods when no one was at home. Once, startled by the sound of people a short distance away, I broke into a run and caught my leg on a jagged branch. Blood pulsed from the deep gash, but there was no time to stop. At home, I put on thick bandages and told my mom it was a gym class injury. I still have the scar, a slight, dotted line up my left shin. On another secret solo visit, undaunted by the leg injury, I brought along my father's binoculars and hiked out to the farthest pond. Panning the scene at the opposite bank, I spied nothing new with my enlarged vision. Then I saw it--my heart jumped. It was my own first name, carved large and deep on a thick tree trunk. Preoccupied with conjuring up neighborhood suspects, I lost my footing on a mossy rock, catching myself just before taking an unexpected dip in the pond. That's when I heard it--a single, horrible "plop." The binoculars had broken free from the shoulder strap and had sunk to the bottom of the pond. That night after dinner, my mother went to her studio to paint, while my father went to the living room to immerse himself in a book. I tiptoed in, trying not to shiver. "Dad?" I whispered. He looked up over his eyeglasses. "Remember how you always say that I can tell you anything?" "Yes?" He shut his book and looked immediately serious. "What's the matter?" "And remember how you said you'd always love me, no matter what I did?" "Yes, yes! Joy, please, what is it?" I confessed the whole sordid tale, then braced myself to hear my punishment. But my dad didn't yell--he sighed in relief! The binoculars weren't that important, he told me; it was my safety that concerned him. He told me firmly not to go into the woods alone again. Together, the next day, we retraced my journey, and I brought him to the sound of The Plop. With a long tree branch, he poked and prodded around the bottom of the pond. Then he tapped at something. With one long, careful lift, he raised the branch. The renegade binoculars emerged from the water, dripping with mud and covered with leaves. After the binoculars were professionally cleaned, my father gave them to me to keep, for future forest trips--together. The winter I turned eleven, I still didn't know how to ice skate. All of my friends were twirling and leaping on the town lake, but I was too embarrassed to learn to skate in public. One early Saturday morning, with my sister's old skates tied together and slung over my shoulder, I followed my dad to the Binocular Pond. He threw a large rock at its center. It thumped and skidded to a stop. "Safe to skate." After we laced up our clunky, impossible skates, he held both of my hands and glided backwards, and I clumsily trudged forwards and sideways on the blades. Around and around we went. He'd free me and I'd falter. Finally, exhausted from all the legwork, I rested on a rock while my father etched smooth, grand figure eights on the ice, not one sound except for his skates, clicking and wooshing across its surface. Snow had carpeted the forest with white velvet and the trees wore a hundred million twinkling diamonds, glittering from every branch. When morning melted into afternoon, we headed home for lunch. I didn't master skating that January, but I will never forget that day's perfection. Although in our hearts, the forest was "ours," it didn't really belong to us at all. By the time I was in college, the woods in its entirety was sold to developers. The summer after my senior year of college, when I went home to my parents' house, I looked out the window of my childhood bedroom, only to see the single line of trees, a mere screen between our yard and the new yard behind ours. On the very edge of our property, where the woods once began, I could see the little ring of rocks that marked the burial site of Snoopy the cat. The grave was shaded by my sister's five "miniature" Christmas trees, by then so tall, they dwarfed our house. But the forest is gone now; all of it, gone. Magic Rock, the tadpole stream, the wildflower meadow, Binocular Pond. In their places are new landmarks. Swing-sets and swimming pools, circular driveways, three-car garages, front yards and back yards, houses and more houses. For miles and miles. It was many years ago that we sold our house. My parents have long since passed away. My sister and I live on opposite ends of the United States. Much time has passed; many things have changed. But when I close my eyes at the end of a long day, it's the old woods at Willow Lane that I'm picturing. I'm at the very edge of it, and I'm starting down the dirt path, following my dad, just as I drift off to sleep. Dedicated to my father, Charles Johnson (1924-2002), who lived a green life long before it was the popular thing to do, and perfected the art of kindness. © 2012 by Joy Sussman/JoyfullyGreen.com. All rights reserved. Photos and text digitally fingerprinted. Site licensed by Creative Commons.